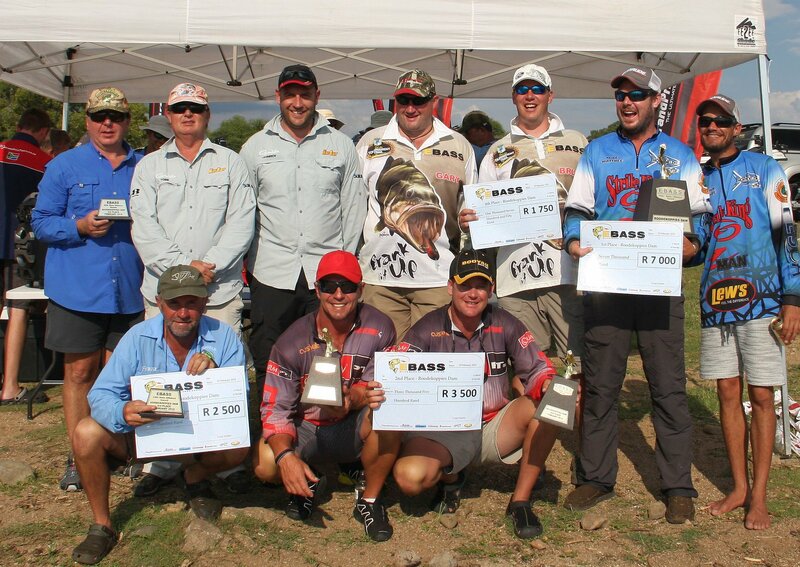 EBASS opened their 6th season and first event for 2018 at Roodekoppies Dam, with an encouraging 33 team entries. This popular series once again attracted some of the top anglers in Gauteng, and also managed, under difficult economic conditions, to substantially increase its total number of entries for 2018. Roodekoppies proved to be a great choice, with some excellent bags being presented by the teams on the day. Although the dam was only 70% full and water levels dropping consistently during the days leading up to the event, it did not seem to impact negatively on the quality and size of the fish presented at the weigh station. The total prize money on offer for 2018 was increased to a fantastic R 17 500 per event, supported by our stunning EBASS trophies for the top 3 teams as well as the big fish winners. The bass population seems to be really thriving in Roodekoppies Dam at the moment. The dam has been producing many big bags, week after week for the last couple of months. The bass caught during the EBASS event and pre-fishing, were generally in a very good condition – even the smaller rats, of which there were many, appeared to be in a good condition – certainly no lack of food here. The best bags came from isolated boulders and rocky ridges, laying in 10 – 15ft of water, as well as timber – mainly trees and laydowns. A combination of the two types of cover, sweetened the deal further and produced some great bass. F1 Grand Prix Tours, Escape Boating, Climbing Kilimanjaro and Bark Unlimited. Your continuing support for the new season is highly appreciated! It is a privilege for EBASS to team up with these great 3 partners and we look forward to continuing a hopefully mutually beneficial relationship, for many years to come. The next EBASS event will take place at Rust de Winter Dam on the 03 Mar 2018. Rust de Winter has produced some really good bags lately and should make for some good fishing. EBASS will once again accept day entries at R 600 per team. Interested teams should please complete the day entry form on our website (www.ebass.co.za) or contact the EBASS committee (082 579 0792) for further event details. The 2018 EBASS series will consist of 8 qualifying events, with the best 7 to count in order to qualify for the 2018 EBASS CLASSIC and for there, possibly for the SABAA TEAM SUPER FINAL. Teams entering on or before our Rust de Winter event will therefor still be in a excellent position to qualify our final events and may enter on the EBASS website (www.ebass.co.za). DON’T DELAY – JOIN SOUTH AFRICA’S CHAMPION TEAM TRAIL TODAY! No Replies to "THE EBASS TRIAL – Roodekoppies Dam 2018"